To mark the 60 year reign of Her Majesty Queen Elizabeth II, their Royal Highnesses the Prince of Wales and the Duchess of Cornwall visited Toronto in May 2012 to mark her Diamond Jubilee. The City of Toronto offered its congratulations to Her Majesty upon this historic occasion. 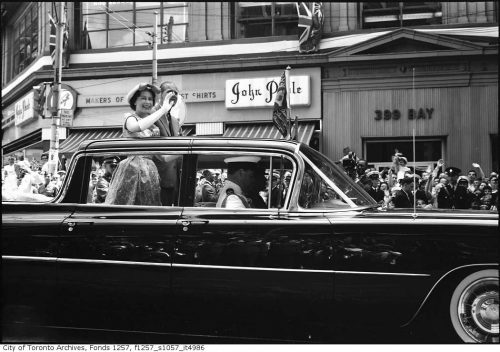 As part of the city’s celebration of this event, the Archives compiled this web exhibit highlighting Her Majesty’s past visits to the ‘Queen City’, one of Toronto’s historic nicknames. 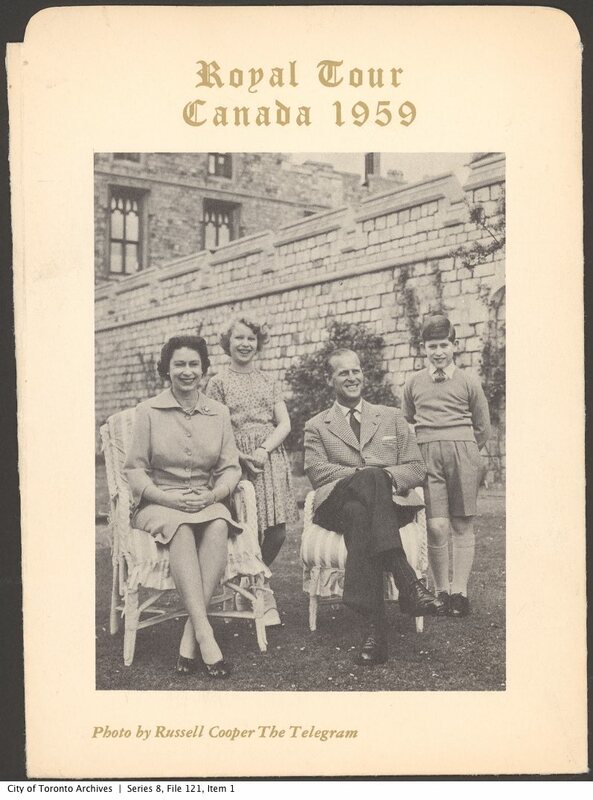 On February 6, 1952, while in Kenya, Princess Elizabeth received the news of the death of her father, George VI. 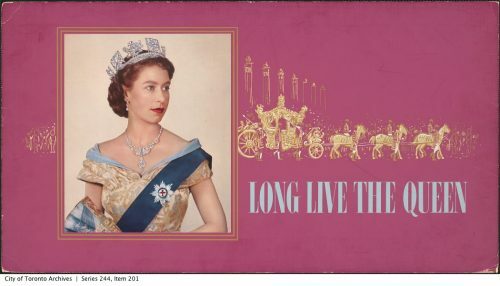 At 25 years of age, she had acceded to the thrones of the United Kingdom, Canada, Australia, New Zealand, South Africa, Pakistan and Ceylon. 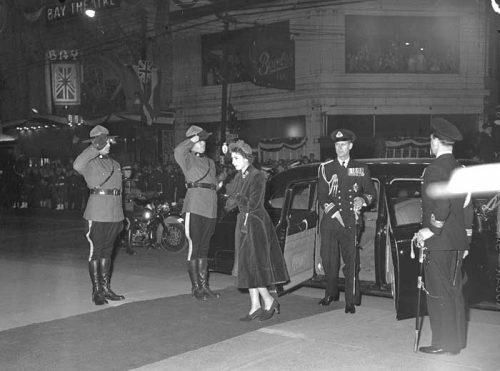 The most widely travelled commonwealth monarch, Queen Elizabeth II has made 22 official visits to Canada and seven to Toronto. 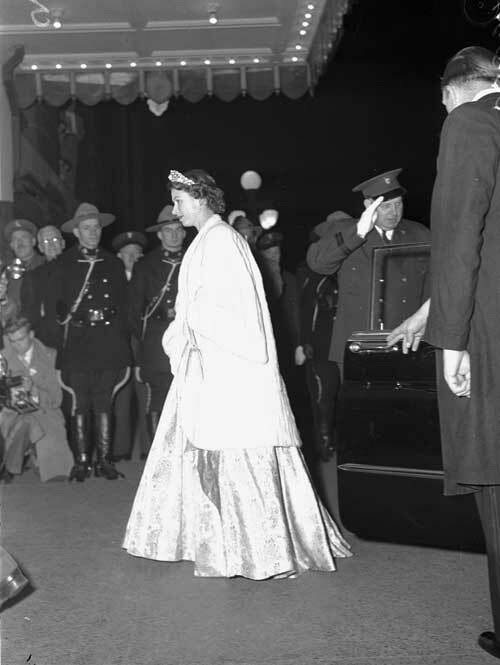 Her first was in 1951 as Princess Elizabeth, where she visited in place of her father who was ill, and the most recent was in 2010. 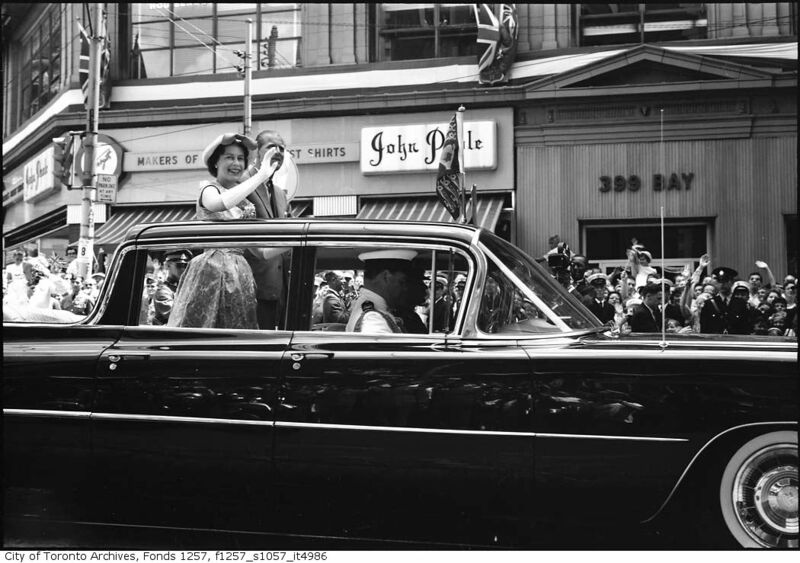 Images from Princess Elizabeth’s 1951 visit to Toronto and of her travels elsewhere in Canada that year can also be found on our website. Her Majesty’s first visit to Toronto as Head of State came as part of the 1959 tour of Canada. 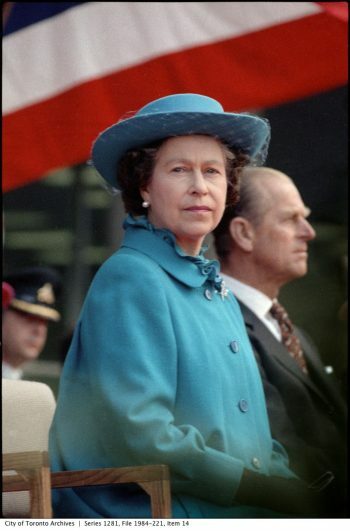 One of her duties was to open the St. Lawrence Seaway. She and US President Eisenhower boarded the Royal Yacht Britannia at St. Lambert, Quebec for a short voyage through the locks, formally opening the canal. Then, in a strenuous 45 day tour of the country, the Queen and Prince Philip travelled to all 10 provinces and two territories. The Royal couple sailed into Toronto Harbour aboard the Britannia, were welcomed in Etobicoke and were special guests at the 100th running of the Queen’s Plate at the Woodbine racetrack. 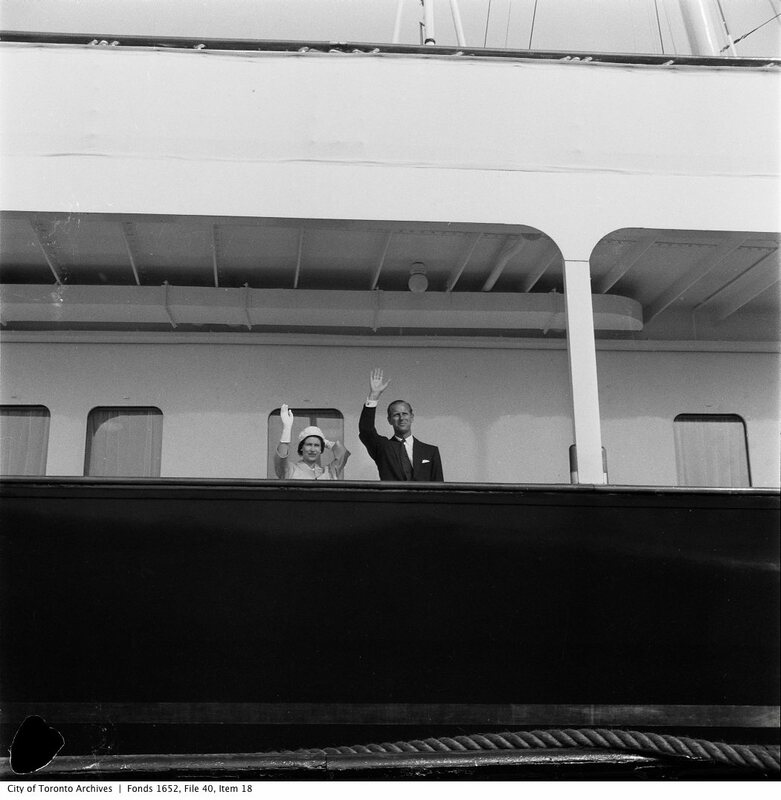 Her Majesty next came to Toronto in June 1973 as part of an extended tour of Ontario. She visited Queen’s Park, Ontario Place and High Park, where, as part of Ontario Conservation Week, she released 100 tagged bass into Grenadier Pond. While in High Park she also attended a Black Creek Pioneer Village exhibit, featuring a demonstration of the chores and skills of pre-Confederation Ontario, where she received a hand-made corn broom from village broom-maker, John Adams.In 1984 the Queen and the Duke of Edinburgh were again welcomed to Toronto, to help celebrate its 150th anniversary. 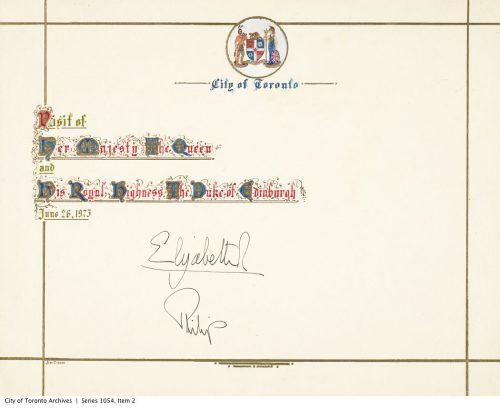 The city’s original Act of Incorporation in 1834 had received Royal Assent from the her Great-Great Grandmother, Victoria. 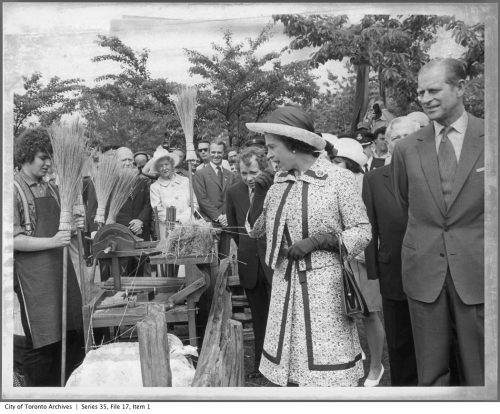 During the celebrations the Queen took part in the Metro International Caravan, Toronto’s festival of international culture, and formally dedicated the Peace Garden on Nathan Phillips Square. She also visited the Royal Ontario Museum and was greeted by thousands of members of the Italian community on St. Clair Avenue West. 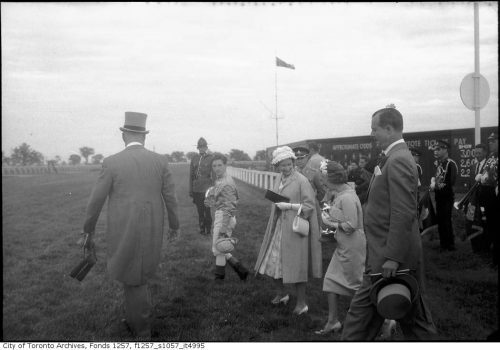 Her Majesty returned to the city in 1997, in 2002 for her Golden Jubilee, and in 2010, where she was again a spectator at the Queen’s Plate, a race meeting she last attended in 1959. 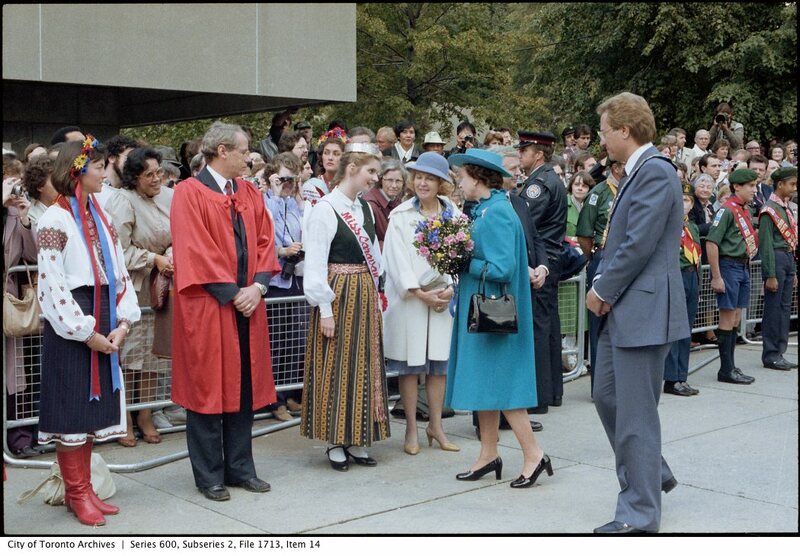 Toronto has changed a great deal since the Queen acceded to the throne. 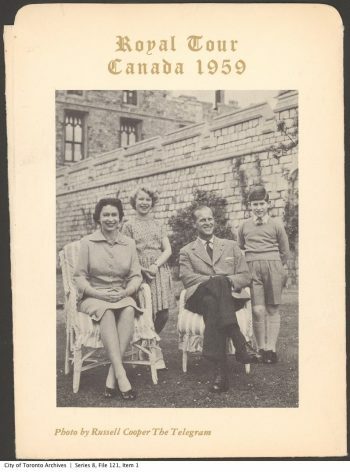 In 1952 over 70% of the city’s residents were of British extract, protestant and Canadian born. The population has more than doubled, from 1.1 million people to 2.6 million. 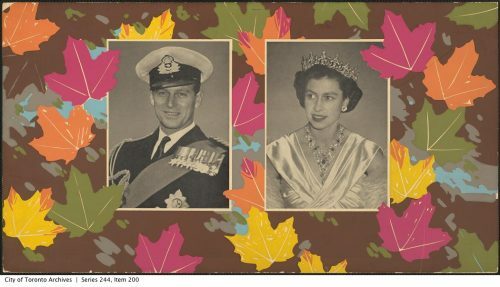 There now more than 200 ethnic groups represented in Toronto, speaking over 140 languages, and more than half the population was born outside the country’s borders. 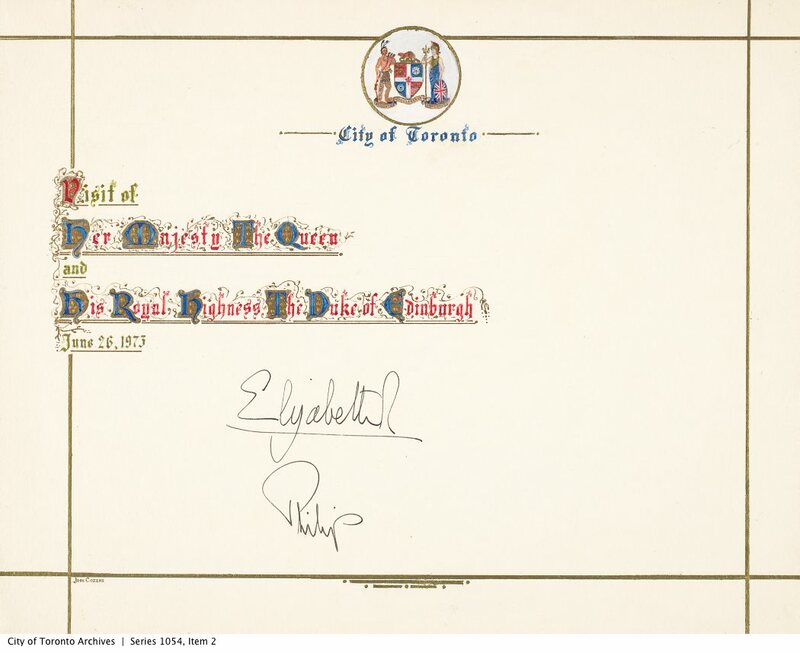 Fifteen mayors have held office during Elizabeth’s reign.